Not every workshop turns out to be a delight. 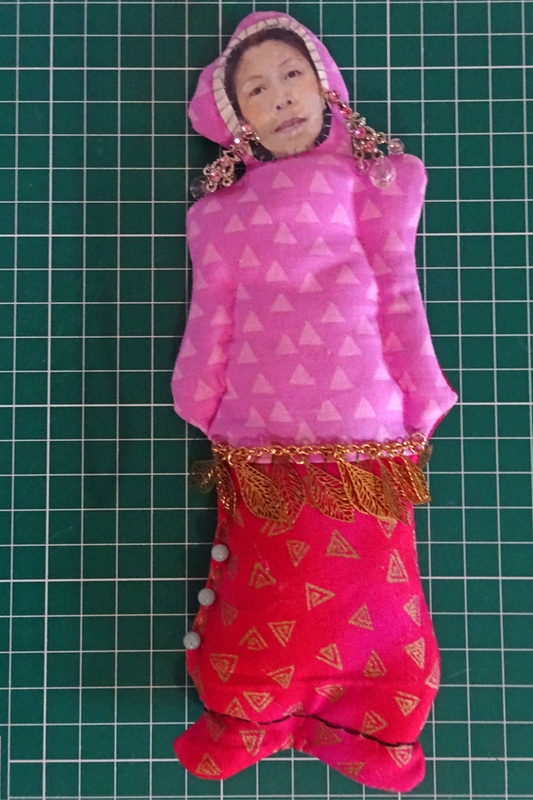 When things don’t go according to plan, or boredom creeps in, to spice things up suggest we make an art doll. The word is like a koan as heads turn, minds still, eyes stare in disbelief. “Art doll?” a participant exclaims. “Why yes,” someone else chimes in. As I listen to a why not followed by a yet how? Who doesn’t like to be immortalized? Vikings worshipped the idea of fame, their name going down in history. These days we attempt the same with an iPhone Selfie. 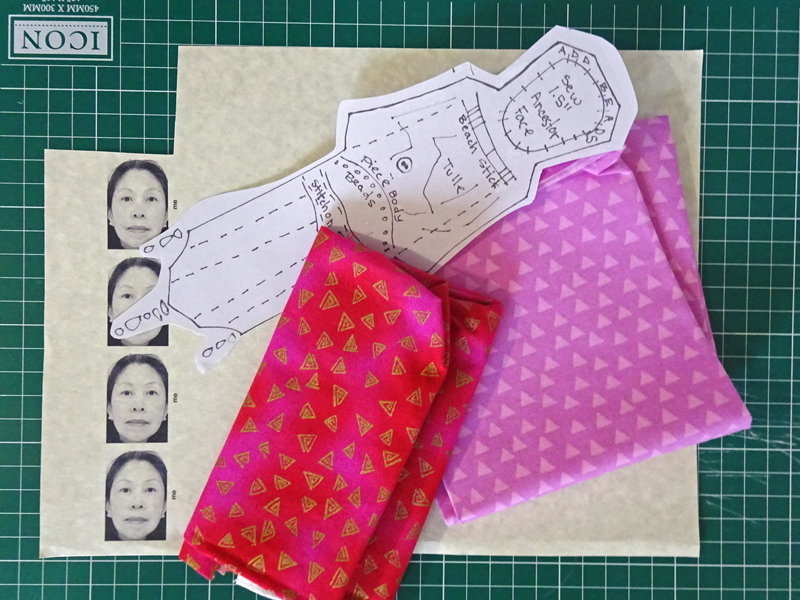 So why not gift yourself with a hand sewn self-portrait/icon you can call your own. Pamela’s Patterns, by Pamela Hastings, 2017. 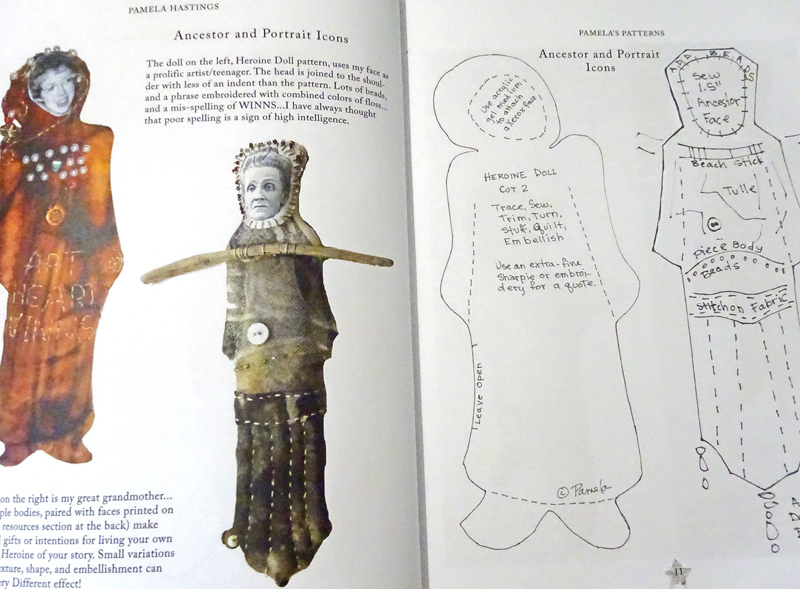 Intrigued by the unique ancestral doll pattern on page 11, I scavenge through my wealth of fabrics and find two that suit my needs. Materials to make Portrait Icon. I scan a passport size photo of my face and sharpen the image in Photoshop. Satisfied with the image I print it from the printer on a sheet of parchment and set the page aside. I proceed to reverse the fabrics, carefully cut around the pattern, pin it to the fabric and hand sew the front and back together leaving an opening on the side. I turn the fabric figure inside out and use the opening to stuff cotton through. I choose not to overstuff. It’s easier to pass a needle through the areas that form the arms and any other areas I decorate with fine threads and embellishments. Once stuffed, I sew the opening closed and add three beads to hide the stitches. Cutting out the scanned photo of my face, I proceed to brush several layers of Acrylic Gel Medium on the surface to seal the print and prevent the paper from tearing once I begin to sew it to the fabric. The gel doesn’t take long to dry, so while I’m waiting I gather embellishments and keepsakes to personalize the figure and make her my own. When the scan is dry, I brush some gel on the area where the photo goes. 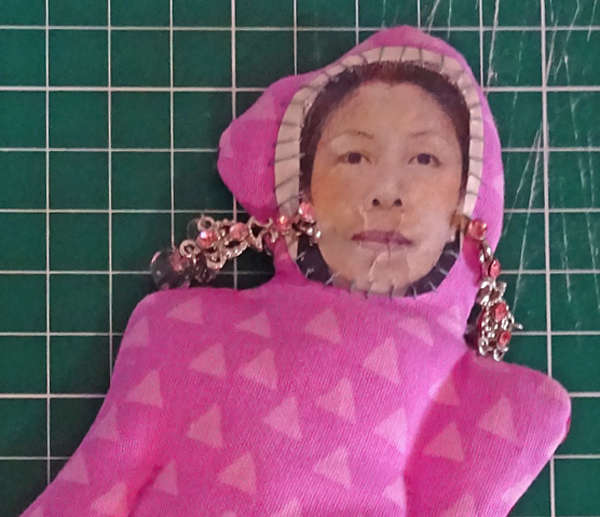 I press the scan down flat, then begin to sew a simple stitch around the face. Portrait Icon. Scanned image with gel medium and stitches. With this type of doll making I feel the focus is on the process. My attention is on the activity. I concentrate on the doing, on the work at hand at the moment in which I find myself, instead of thinking ahead and worrying about sewing the perfect doll. This doll making process reminds me how uncomplicated a sewing project can be when one is completely in the moment; simply minding the passing of the needle going in and out through the cloth without hesitation or self-concern. Primes or Primitive Dolls are sewn in this manner. Lop-sized and eyeless, Prime dolls were (and still are) pieced together out of consequence. People used to make dolls from twigs and clothes pins, from burlap bags, discarded tin cans, even sibling hand-me-downs. Simply wrapping a cloth napkin around a stick and making a knot for a head was known to make a child smile. Truth be told I’m swept away by the sewing. I forget to take pictures. I simply keep sewing and keep adding a bead here, a bangle there until she feels perfect to me. Ivette’s Portrait Icon using Pamela Hastings pattern. Still when I consider her finished form, I feel there’s more to say, more that needs expressing. Contemplating the image, I continue the expressive arts process. I add her to the sequence of creative activities Natalie Rogers would use to self-discover. I can choose to dance or sing, draw or paint to her form; make a SoulCollage® card and add it to my Community Suit. A seer and a reaper. A lover to my lover. A storyteller and a dreamer. A shape-shifter becoming whomever I please. 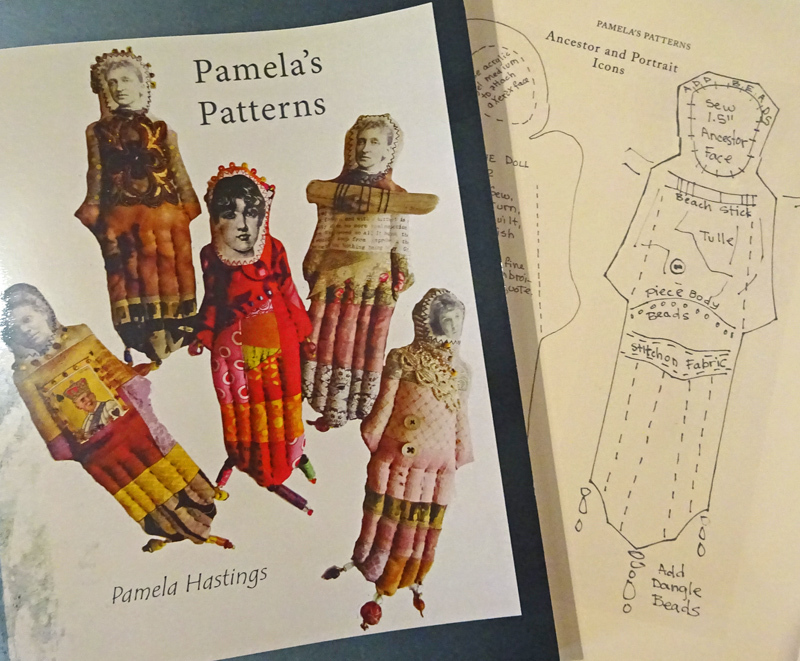 From a doll maker who adores your creations, thank you Pamela Hastings for publishing and sharing your inspiring designs and doll pattern book for all of us to enjoy now and forevermore.